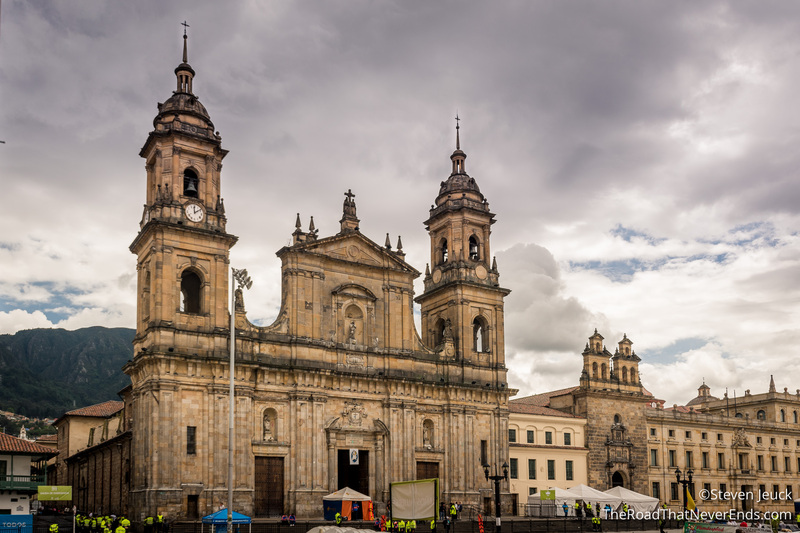 We spent a few days in the capital city of Bogotá and soaked in beauty, history and culture. Bogotá was the capital of Spanish rule in the New Kingdom of Granada in 1538. After independence from Spain, it remained the capital in 1819 in the New Granada. It has remained the capital through several territory changes into today’s Colombia. Today, Bogotá is home to 58 museums, 68 art galleries, 33 libraries, and plenty of parks, sports venues, theaters and monuments. There is plenty to see and do here for tourists and their locals – over 9 million in the metro area. For us, our stay was short and had some issues. Steve felt sick the first few days we arrived in Bogotá. We suspect his headaches and nausea might be related to altitude sickness. 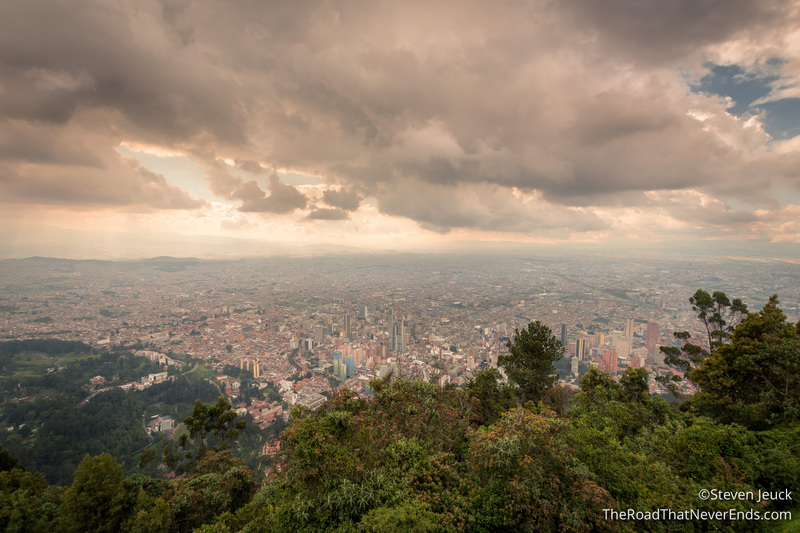 Bogotá is at 8,600 feet, and coming from Cartagena, was an adjustment for us. We did make the most of what we can in Bogotá, which included great food, museums, views, and meeting a family from Springfield, Virginia! Small world! If you guys are reading this – hope you made it back safely and had fun! We stayed in the El Retiro area of Bogotá. It has tons of shopping and restaurants for us to enjoy. We felt very safe there. The only downside is that it is far from the museums and sights – with traffic can take 30-45 minutes to get to. We fell in love with a local small shop to our hotel, Provenzal. 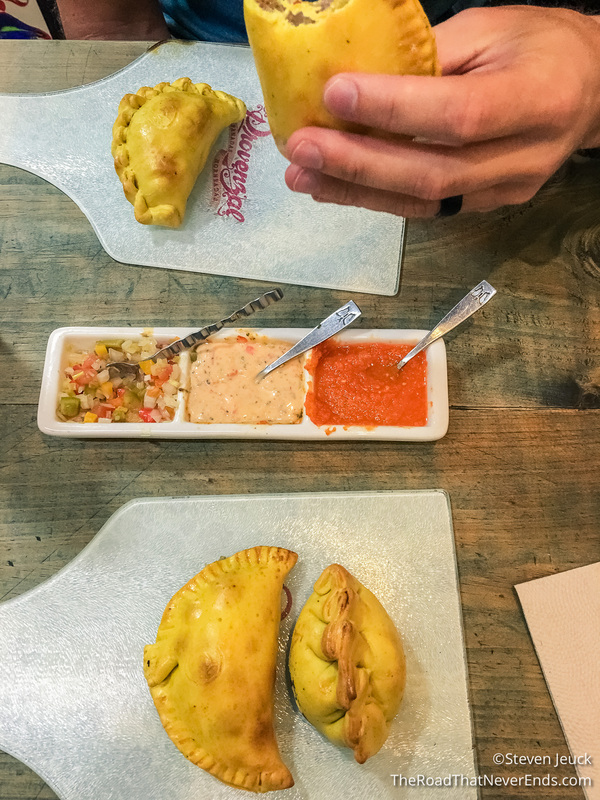 They serve baked empanadas. Their slogan is “Made with Love” – it was homemade, fresh, and very delicious. We didn’t take advantage of public transportation, but was excited to use Uber again! Besides Uber, we also got around by yellow taxi (in areas we couldn’t get WiFi). 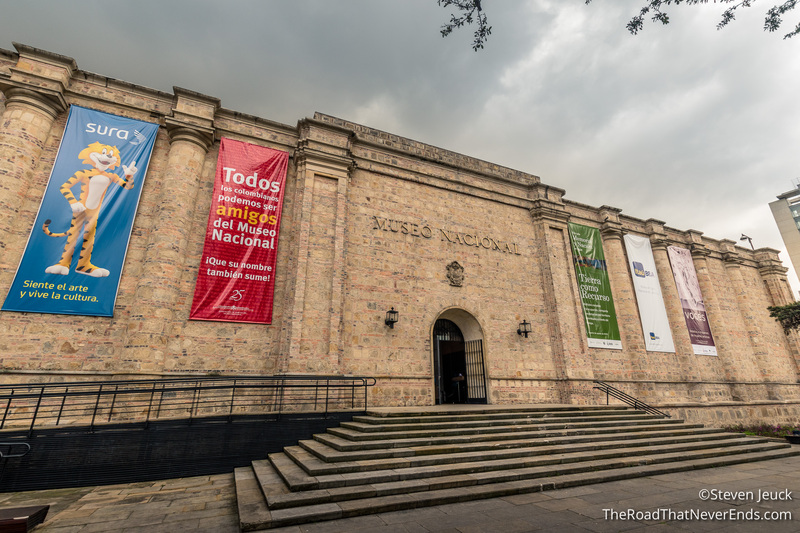 Museo Nacional de Colombia [National Museum of Colombia] – Colombia’s oldest and largest museum. The museum is housed in an old prison, making it a unique museum experience. The museum has artifacts and art spanning from prehistoric times to today. You can get in for 3.000 pesos. Steve and I found this museum to be a little lacking, especially since it’s the country’s national museum. They are in the process of updating rooms, and the one section that has been updated was vastly superior than the other sections. I hope they continue with the renovations. 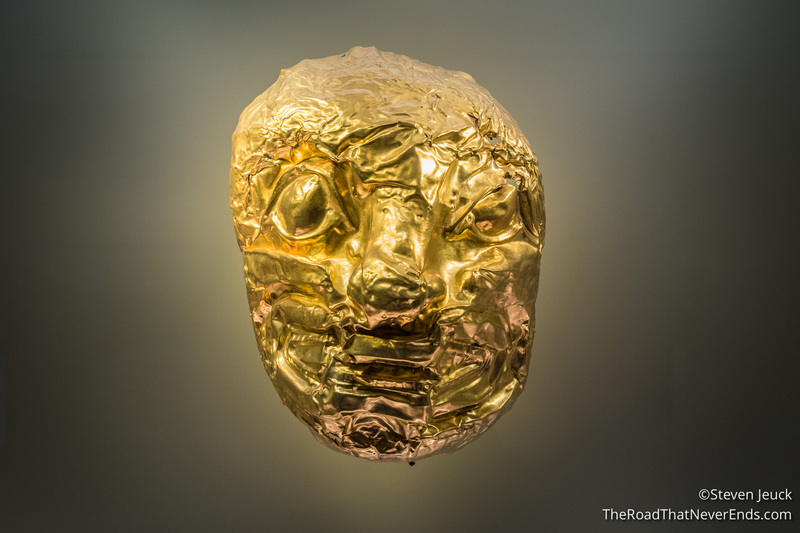 El Museo del Oro [The Gold Museum] – Bogotá’s most popular museum, receiving 500,000 guests a year. 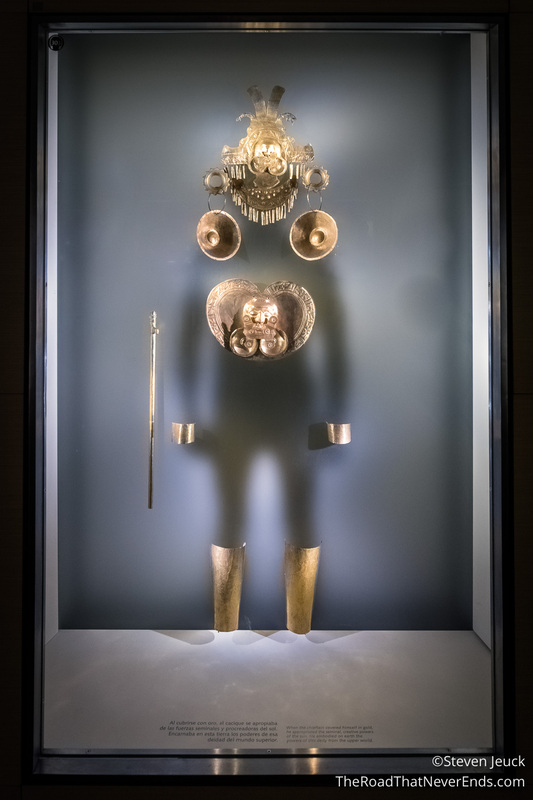 The museum displays a large amount pre-Colombian artifacts, pottery, and metal works. Three floors of artifacts, it is truly amazing! And as in its title, lots of gold, a must see. It too is 3.000 pesos. Monserrate – A mountain near downtown Bogotá, the mountain sits at 10,000 feet above sea level. On the top are restaurants, shops, a 17th century church, and views for miles. Steve and I took the “funicular” train up to the top, but you can walk, or take a cable car (it was down for maintenance). Plaza de Bolivar – This is the main square of Bogotá. 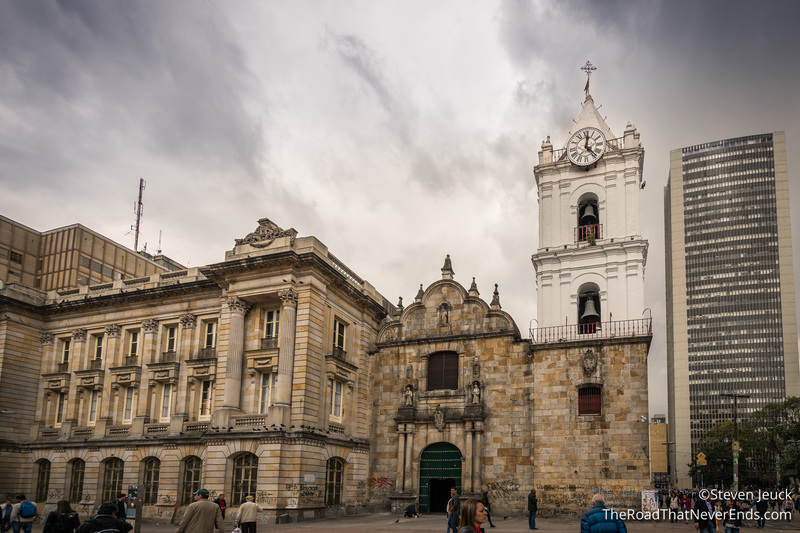 Surrounding the square is the main buildings of the city: the courthouse, the National Capital, the Cathedral of Colombia, the Council center, and the Liévano Palace (seat of the Mayor of Bogotá). They have many events here, as the square can hold over 50,000 people. While we were visiting, the square was closed to visitors. They were preparing for a weekend long festival that included salsa dancing (at least we believe that’s what the signs said). 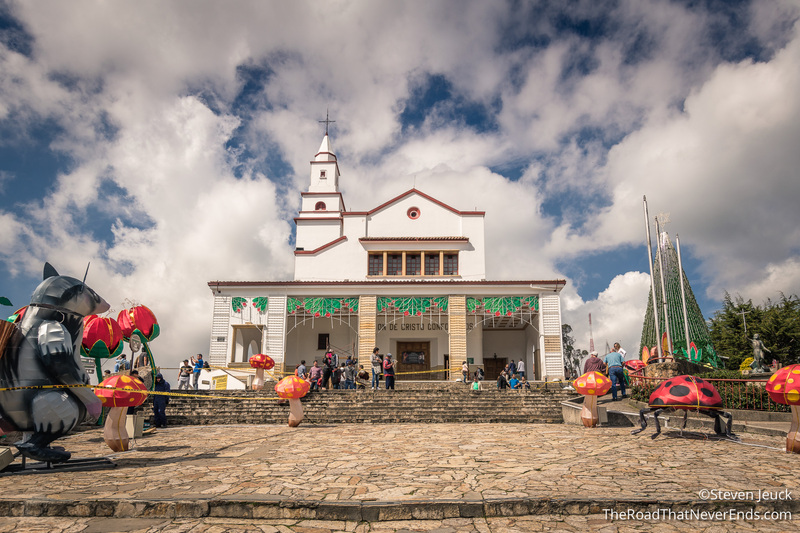 Iglesia de San Francisco – This church was built between 1557 and 1595, making it the oldest preserved church in Colombia. We weren’t allowed to take photos inside, which is too bad, it is breathtaking. The outside was a little run down which was unfortunate as it really doesn’t do the inside justice. Check it out – gold everywhere! We spent 16 days in Colombia and had an amazing time. The food, culture, art, museums, and happy people will make this a trip we will happily remember for our lifetime. Both Steve and I enjoyed Cartagena the most, followed by Medellín, and then Bogotá. We already talk about going back in the future to explore different areas in Cartagena. I would love to return to Colombia and explore Nevado del Ruiz, a volcano located between Medellín and Bogotá. The bigger cities have Uber – I recommend this over using Taxi. If you have to use Taxi (like in Cartagena), do know that most places don’t have meter fare. You will have to negotiate a price before entering the taxi. Bogotá was the only place that consistently used meters. 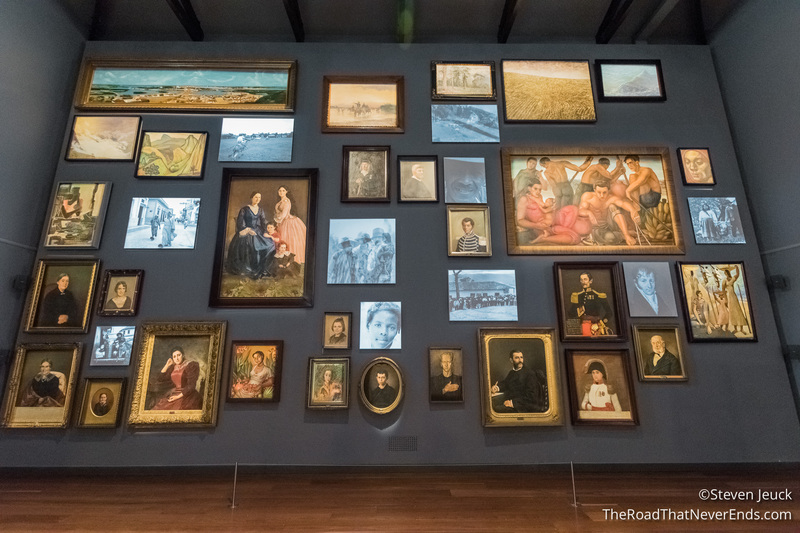 In Bogotá, we found there is some English speaking, and the museums had both Spanish and English. In Cartagena and Medellín, English speakers were rare. A common misunderstanding Americans have when traveling is that eating at restaurants is not as fast paced as it is in America. Don’t be surprised if you are at a restaurant for a few hours. It is like this in Europe, and it is like this in Colombia. The servers don’t want to rush you out, they want you to enjoy the experience. We were at dinner in Medellín when an American couple was yelling at the servers for how long it took to get food, and to get service. To top it off, they were yelling in English – so I am not sure the servers really understood what they were upset about. So, here is my advice. Plan some extra time when eating out here. Try you hardest to learn some basic Spanish lines. Your effort will go a long way here. We traveled in November, and no joke, the weather forecast was rain EVERY DAY! Most days we got lucky, and we had only cloudy weather. Other days it felt like all hell broke loose and experienced the craziest rain we have had in our lives. At one point the streets of Medellín turned into a river, and we had to be smart about how to get back to our hotel. The point is – the weather changes in an instant here. Be prepared with a rain jacket if you are traveling during its rainy months. Like traveling in any big city, stay vigilant, watch your belongings, and use common sense. Colombia has a stigma for being an unsafe place, but they are really trying to change that. I can honestly say that Steve and I never felt unsafe at any point during our trip. Until we meet again Colombia, hasta luego!